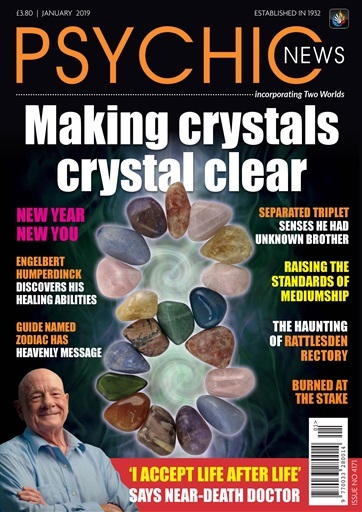 In the January issue of Psychic News magazine we welcome in 2019 with a bang! 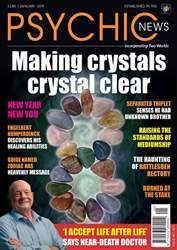 Crystal expert and author of over 45 books, JUDY HALL, makes crystals crystal clear for us all, and we have an exclusive interview with DR RAYMOND MOODY, of Life After Life fame, who has investigated near-death experiences for decades. BARBARA WHITE says that “Exciting times lie ahead for every single one of us!” in her feature “New Year new you”, and medium ROBERT BROWN comments on personal responsibility, whilst BILLY ROBERTS tells how hundreds of thousands of people were put to death after being accused of witchcraft in “Burned at the stake”. STEPHEN O’BRIEN explains the vital differences between psychic and mediumistic messages as he tries to raise the standards of mediumship. We take a look at the Greater World Association in the feature titled “Guide named Zodiac has heavenly message”, and JOHN WEST shares the spine-tingling tale of the haunting of Rattlesden Rectory. In news, we have an exciting story about the restoration of the FOX SISTERS’ school as it becomes a Temple of Peace for Spiritualism. “Separated triplet senses he had unknown brother” tells how astonishing similarities emerge between three brothers who were separated at birth in a secret nature versus nurture study, and ENGELBERT HUMPERDINCK reveals his healing side. The editor’s interview is with medium BRENDA LAWRENCE, and Turkish-born inspirational artist Servet Ozen shares his spiritual art.